I attended the Knitting and Stitching Show in Olympia the other week. I thought it would be fun, and that I’d possibly pick up a bargain or three. I attended early on Thursday morning, I was so glad I did! I ambled gently around the stalls, making notes here and there, and decided to just pop to the loo before making some carefully considered purchases within the sensible budget I’d set. When I emerged, it was as if two dozen coaches of determined stitches had disgorged themselves in the hall. An army of crafters were determinedly hedgehogging about, having fisticuffs over the last length of novelty quilting cotton and so forth. If you ever plan to go, go early. And, an aside, I think of women like these when I hear that women over a certain age can’t or won’t use technology. There was an excited throng around every demonstration of an absurdly complex machine, technique or new gadget – and not a booth babe in sight. Whilst I don’t think I seized any bargains as such, I think I broke even, by saving on p&p costs and the like. 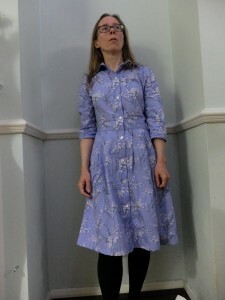 I also met 2 of By Hand London and bought the Kim dress pattern. I stopped short of asking them to autograph it. 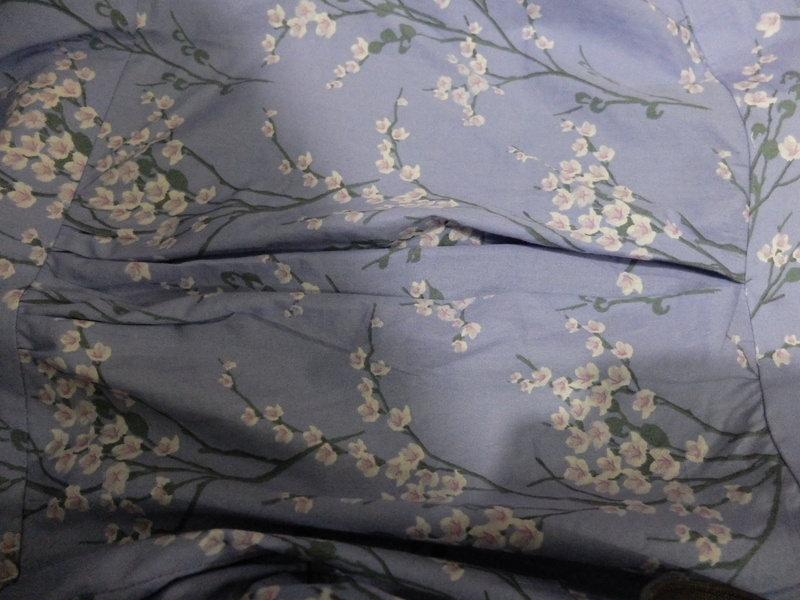 I managed to grab the last 1.5 m of Liberty Carline poplin, and 2.5m of this lovely springlike, sprigged stuff. Back home I started work on another (I blame Idle Fancy for all these) McCalls 6696 shirt dress, in the blossom print which I’d seen online in various places, and found it here for £6 a metre which I didn’t think was bad going. 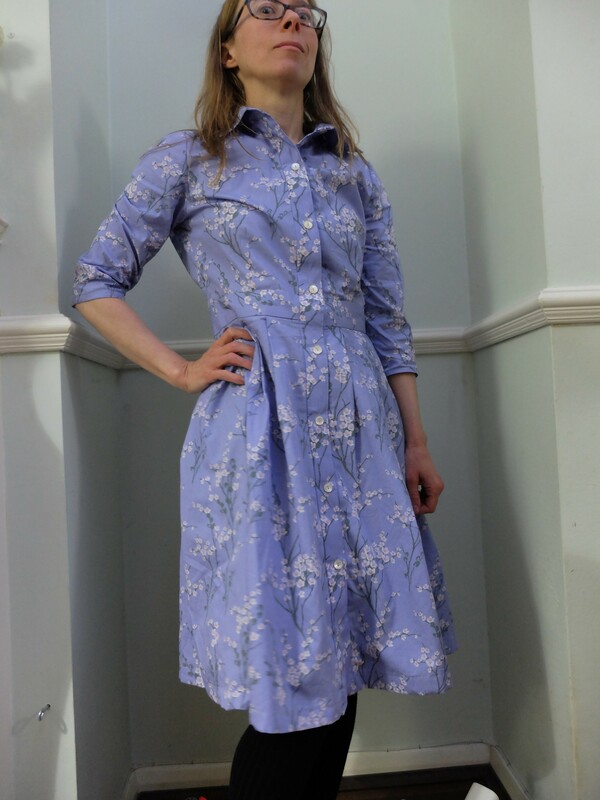 I chose the pleated, full skirted version and used the elbow sleeves again rather than the short ones suggested – this is a London spring we’re talking about. I’m not worried about showing my arms, in fact I’m happy to flex my biceps for anyone who asks, but I’ve plenty of sleeveless dresses already. I was slightly worried I’d look like one of those women who sews apron fronted modest dresses for apostolic communities, but I figured if that happened, I’d just undo an extra button. Modesty is of course my main virtue. That and enjoying ironing. I’ve read a lot about the back gathers bunching out – apparently it’s an issue in the smaller sizes. My previous version bunched out so much that I almost despaired, but fixed it with a pleat rather than gathers. However, with this version I pleated the lower half only and left the top gathers. I hoped that the weight of the skirt would pull the bunching down, this being the wide pleated skirt rather than the pencil version before. Doing the pleats did my head right in as I had not (of course) bothered to translate the markings properly, had lost the instructions and was purely relying on little snips to line everything up. It took ages to work it out. Lesson learned: mark things up properly. No bunching at the back, thank you heavy pleated skirt! As before, whilst 6696 demands inordinate amounts of slip stitching, this brings me out in a rash so I avoided it completely. I used the burrito method learned from the Negroni, a technique which also lends itself to making the gusset of knickers, if you’re interested in making your own knickers. 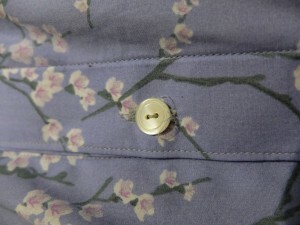 Take the yoke piece and pin it to the long back seam, right sides together, and have it hang down the back of the bodice. Then bundle up the rest of the bodice, loop the yoke piece around the whole shebang, pin the shoulder seams, and stitch. Once unravelled you should have a clean finish inside with no hand stitching. This takes a little spatial awareness and I’d strongly advise doing a trial run with pins or basting to make sure everything is the right way round. I topstitched the waistband, placket and collar stand. Next time I’m going to try this tutorial for a different way to do collars, as I think it’ll suit my slapdash nature. Topstitched. Because I have a machine to do sewing, dammit. The sleeve and skirt hems are just machined. I had to leave off the pockets, though it pained me to do so, as I only had 2.5m of fabric. 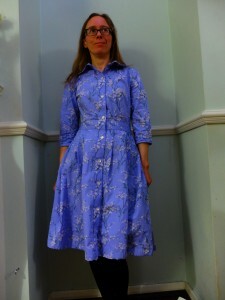 I’m amazed I squeezed so much dress out of that – this cotton is very narrow. No chance of pattern matching, though the sprigs are all facing the same way. Two drawbacks – I think it’s a teeny bit too big, but then again, I’m quite small, and is it too fancy for the office? 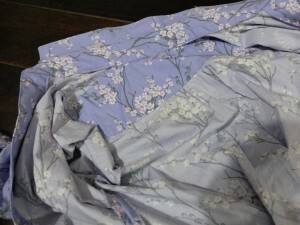 Next time, I will remove the fullness from the back completely and remove about a half inch from the waist and bodice. There is a risk that too much foofiness (foofyness?) is overwhelming in a smaller size. Slightly too big – bonus room for cake. For now, I am going to don a thermal vest and go and hang out around some blossom bedecked trees in the park. Or, possibly, grab a cig, cocktail and Jon Hamm and pretend I’m Betty off of Mad Men. Is that an Old Fashioned?